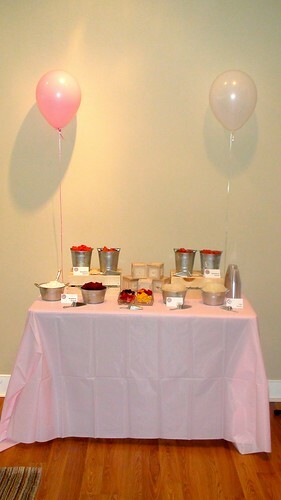 You may remember last year in April 2010 I threw a pink and green bridal shower for my dear friend Amanda. Well, last Sunday I was honored to throw another shower for Amanda, this time for her first little baby girl! As I was brainstorming ideas for this baby shower, I asked the mom-to-be if she had any particular food cravings during her pregnancy. One of my great friends, and nationally recognized party planning diva Mrs. Patra, once threw a cravings shower, and I always wanted to throw one of my own. So when I learned that Amanda was craving anything fruity and icy I had to turn up the creativity a few notches, especially since I was giving her shower during a July heat wave in Washington, DC! The shower was to be on a Sunday afternoon in July, around 2:00 pm. I didnt want to do anything too hot or heavy, or a full-on meal since the time was shortly after lunch, so I searched the interwebs (and Pinterest, my new favorite social network) for fruity and icy desserts. And the interwebs led me to an idea I had never heard of but desperately wanted to try: Granita. Granita is basically Italian Ice or as we call it in my hometown “sno-cones” but without the cone. Now dont let Snoopy or Bed, Bath and Beyond fool you, it is unnecessary to buy a specialty device to make your Granita, Italian Ice, Sno-Cone or other equally delicious icy treat. You can do it all with a few simple ingredients: fruit, sugar, water, a pyrex or cake pan, and a freezer. The main tools you will use for this dessert are a wooden spoon, a fine mesh strainer or sieve, and some kind of blender or food processor. If you don’t have a blender or food processor, invest in a 2-cup food processor by Kitchen-Aid or Cuisinart. They are small, easy to store and affordable. You will not be disappointed in this investment. First select your flavor (what’s yo flava? ): The options are only limited by your imagination. Basically whatever you can juice or liquify you can use as a flavor. For the baby shower, I used strawberry, blueberry, lemon and lime. Then juice or liquify your flavor: As I said before, if you dont have a means to blend, juice or otherwise liquify, go get you a mini-food processor, or even a magic bullet which has a variety of wonderful uses. 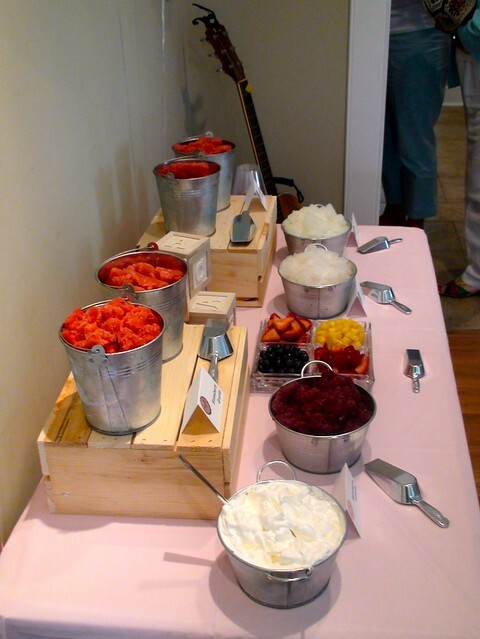 If money is tight, you can use a potato masher or the end of your wooden spoon to get the “juice” out of a berry. It will take a while but its possible. Otherwise, dont use berries, go for something you can squeeze such as the citrus variety. Next, get your sieve on: Sieve, cheese cloth, fine mesh strainer, whatever you like to use or call it, get some kind of straining device with tiny little holes so you can strain the juice out of the pulp that is inevitably left behind when juicing. Technically speaking, you dont HAVE to do this, but I prefer to get all the seeds and pulpy chunks out of my icy treat. Make Simple syrup and add to the juice: At some point after you choose your flavor and before you complete the sieving process, go on and pop a few cups of water in the microwave for about 5-7 minutes (depending on how much juice you are using). You basically want 2 parts juice 1 part simple syrup, to taste. Some like it less sweet while others like their syrup with just a dash of juice. The ratios are up to you, they wont effect the outcome in terms of texture, only taste. After your water is hot, mix in sugar. I typically do a 2:1 ratio of water and sugar for my simple syrup. I am also from the deep south, where our body-water content is 50% sweet tea. So if you like it less sweet knock yourself out. I dont think 2:1 is TOO sweet I think its the perfect ratio for home made granita. But if you are worried about the sugar content, I recommend you make the syrup 2:1 like I describe here, then when you add it to the juice, just add half of the simple sugar then taste it. If its sweet enough, add just plan water for the other half, if its not sweet enough keep adding the simple syrup to taste and supplement the deficit with regular water. Mix it Up: By now you should have your juice and your simple syrup ready to combine. You can either use a mixing bowl OR if you are like me and dont like alot of extra dishes you can just add both the juice and simple syrup to the container you will use to freeze the mixture. I used both a glass pyrex and a tin cake pan (both 9×13) they both work fine. The idea is to freeze the mixture in something shallow. I think you could probably freeze the mix in something deeper, but it will take longer and may not produce the right consistency. If you try it let me know how it worked out for you. Secret Ingredient: At this point, before I freeze, I taste the mix to see if there is “anything missing.” If I am doing a berry or a melon flavored granita, I may add the juice of one lime or one lemon, just to give it that something “extra.” Obviously if you are doing a citrus granita you wont want to add anything to it. But you might. I saw some recipes that intentionally mix a citrus and a berry to produce interesting blends. I say get creative! The point of this step is to check that you like the flavor before you go to freeze. Freezing Process: Here is the hardest part of the whole granita making adventure. Find a way to get your pan/dish of liquid into your freezer without spilling it. Freezers come in all shapes and sizes, so you will have to prepare a place for your granita based on your own freezing conditions. Make sure your granita is secure and wont slip or tump over in your freezer as that would be a big mess. Once your dish/pan is secure in your freezer, let it sit there for 45 minutes – 1 hour. Once its starts to get a nice freeze going, but before its frozen solid, get your wooden spoon and break up what has started to freeze and stir it around a good bit. You will see its kind of chunky/slushy. This is good, this is what you want. Now shut the freezer and let it sit another 30 minutes or so. Then repeat the process with the spoon, breaking up the icy stuff and mixing it around. After about 2-3 hours of this, you will have a great texture and “shaved ice” consistency. At this point, the granita is ready. Now its up to you if you want to eat it now or save it. If you want to eat it now, dig in, garnish ideas to follow. If you want to save it, get some gallon size sip-lock plastic bags and transfer the granita to the zip lock. If you are making multiple granitas, LABEL the zip lock bag before you transfer the granita, as lemon and lime, blueberry and blackberry, strawberry and watermelon, look a lot alike! Once the transfer is complete, press down to get the air out and zip it. Preferably, lay it flat in your freezer. If you can’t lay it flat, do your best. When you are ready to eat it take it out and thaw it for 10-20 minutes, depending on the volume of granita in the bag. And that is how you make homemade Granita, Italian Ice, Sno-Cones. As by now you can see, the options are limitless and I hope that you will try your own flavor combinations and share them here with me. Back to the baby shower. 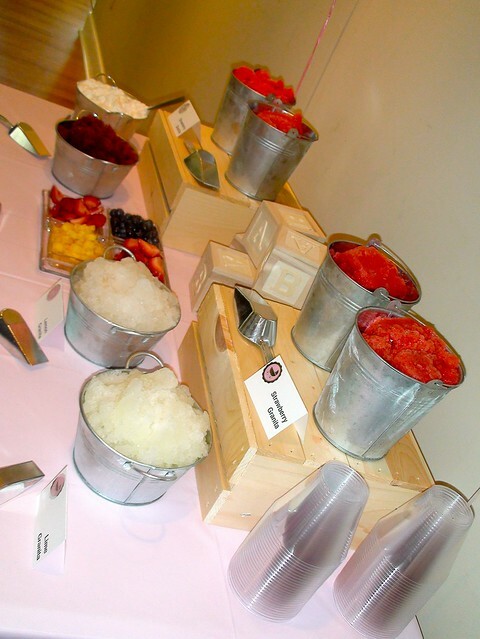 I decided on a “Make Your Own Granita Bar” and I served my Granitas in quart sized tin buckets with scoops. 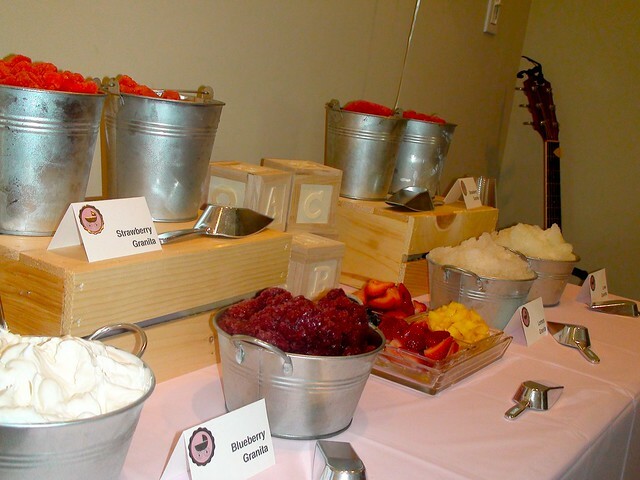 People mixed the different flavors together with cool whip and their favorite fruit garnish. The tin buckets actually kept the Granitas cold and after 2 hours, there was some melt, but still icy enough to go back for seconds (or thirds!). 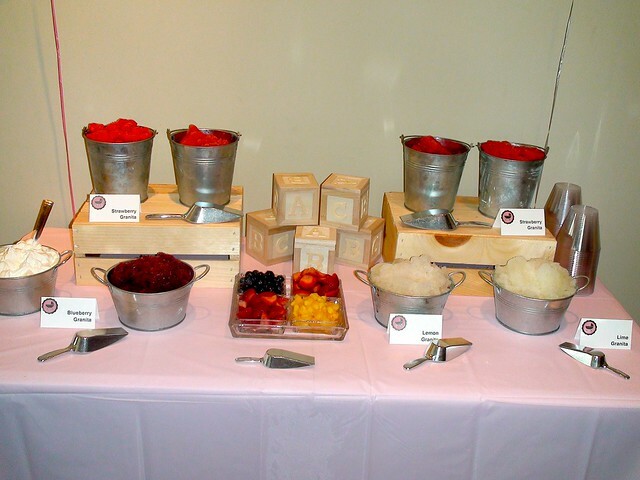 The guests at the baby shower enjoyed the Granitas. In fact, I probably could have just done the Grantia Bar and skipped any additional food, given the time of day and the HEAT! In terms of table display, I got the tins at Party Depot, the wooden crates and baby blocks at Michaels, and the scoops at Bed, Bath and Beyond. I got made the placecards myself on my home computer/printer. Granita’s were served in small, clear, plastic “cocktail cups” I bought at Party City. Table cloth and balloons provided by my beautiful and talented co-hostess Melissa. This was by far the most creative and fun idea I have ever had for a party. I may have out done myself, I am not sure I will ever top the Granita Bar! 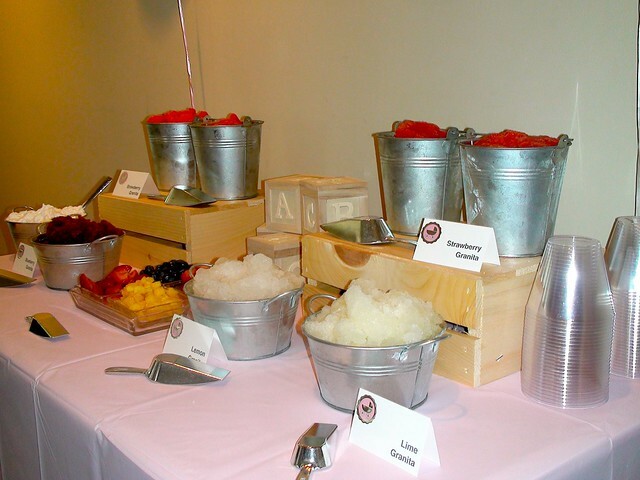 If you were doing this for a children’s party, like a birthday party or even a graduation party, you could serve Granita with ice cream too, let guests mix it up. It would also be fun for kids to have cotton candy or pop rocks as a garnish. You can find both at party stores. If you were doing this for a bridal shower, bachelorette party or some other adult function, you may want to add some kind of cordial or alcohol. I could definitely see some tequila, grand mariner, vodka, peach schnapps, or any of the “Pucker” variety of flavors added to the mix before freezing or offered as a “garnish” but no more than 1 or 2 oz. per serving if using as a garnish. I could even see some Prosecco or Champagne added to a Granita. If you were trying to be fancy you could serve in martini glasses or champagne glasses, you could rim the glasses in sugar or salt or even a combo of sugar or salt and some citrus zest. Seriously unending options here. However, if you do a lime granita with some tequila, it will just seem like a frozen margarita, which to me would not be a bad thing, but may not pull off the “awe” factor of using more thoughtful ingredients. Dear Southern Living: Please put my idea in your magazine! I am sure that your readers would love to try an idea like this one on a hot southern summer day or night! 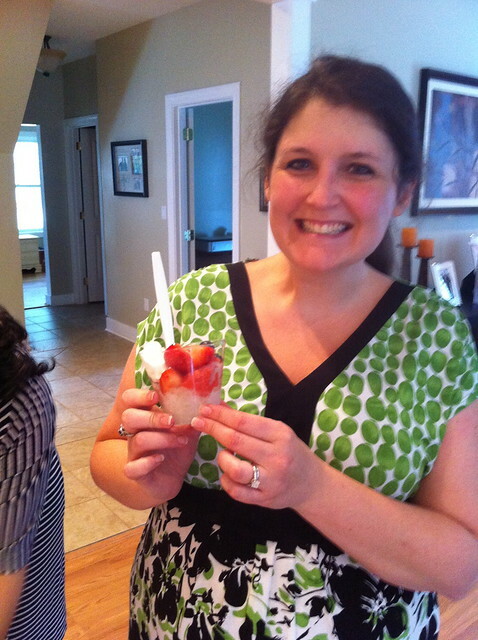 Look how happy I am eating my homemade Granita. It was easy, fun and impressive. I will be awaiting your call. That idea is fantastic, and it looks SOOOOOOO good! May have to steal….